I received this coffee as a gift from my niece in Taiwan. 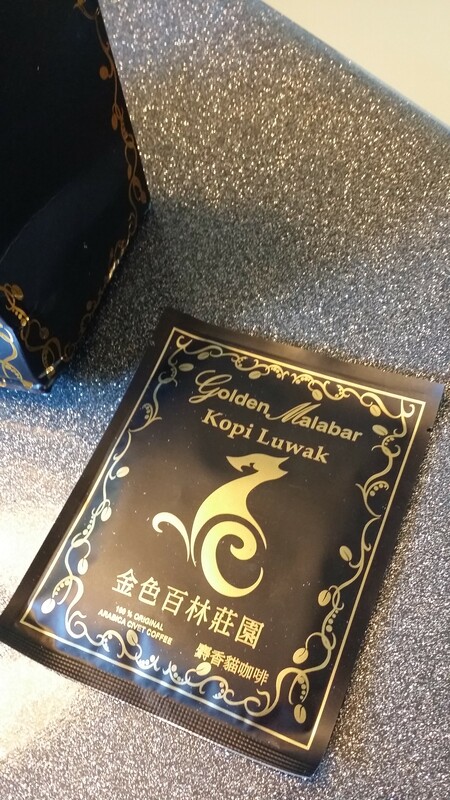 It’s labeled “Golden Malabar Kopi Luwak.” These are coffee cherries grown in Indonesia that have been swallowed and passed through the digestive tract of an Asian palm civet. While I have had “crappy” coffee before, I have never had anything like this, so I was curious to try it. At the end of this review, I’ll include a link to the company’s website so that you can actually see the coffee cherries and their appearance as a waste product. Normally, I despise prepared coffees like Starbucks’s powdered instant coffee, or pre-ground, or basically anything other than whole bean. This as you can see came ground and in little single-serve pour over pouches. Quite clever and cute! The process worked well as we have a hot water pot that keeps water at 208 degrees F all the time. I had to add water, wait, add more water, wait, add a little more water… you get the idea. The contraption did work, however. 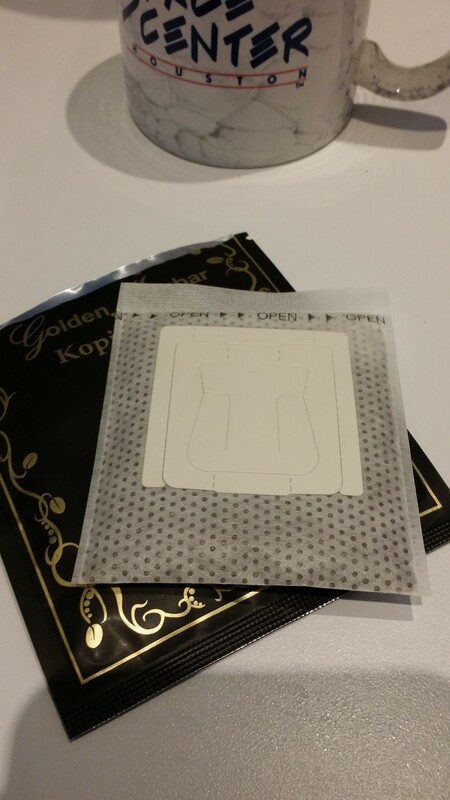 The pouch upon opening had a wonderful berry and cherry smell. Very aromatic indeed. When I added water, the coffee foamed well and released a stronger smell still in the berry family but with hints of citrus. 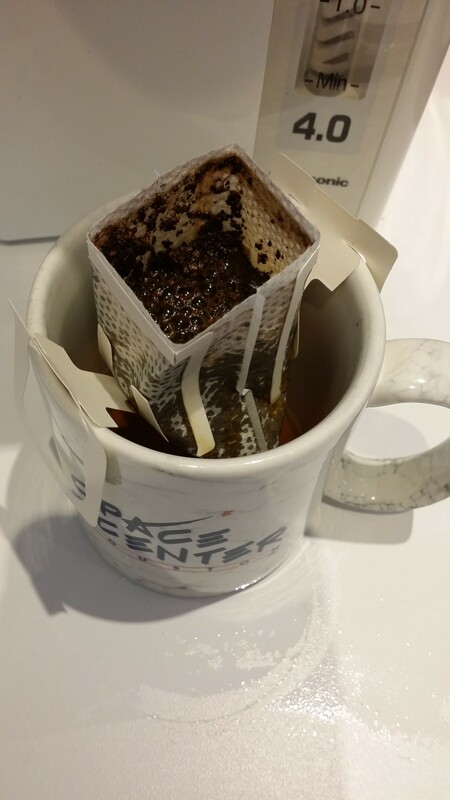 After I let the coffee cool a little, I tried a sip. 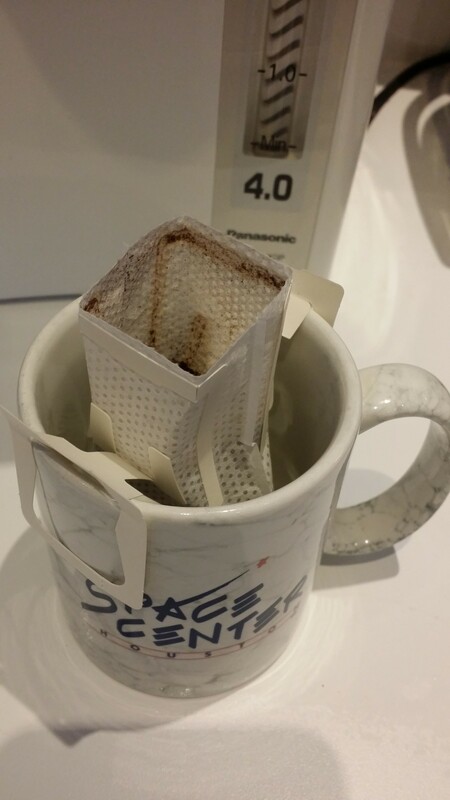 It was not as oily as my daily driver French press. It was light and happy, however. It immediately put a smile on my face. The berries and cherries were still there at the finish. Overall it’s the best “prepared” coffee that I’ve tried. At $32+ per ounce it’s not for everyone, and is probably the most expensive coffee I’ve yet tried. At $512 a pound it’s just a wee bit pricey. In his early years, Mr. Rupert wanted to be a pilot like his father. It was a difficult life, so he decided to be a musician instead. (you may laugh here). All in all, he made it pretty well! He recently retired from being Concertmaster with the Las Colinas Symphony Orchestra and still maintains a large studio of fantastic students in the Dallas-Fort Worth area. He gets to fly for fun, as he is a private pilot. Always interested in learning new things, Mr. Rupert recently started the new business Stallion and Mare ReHair after studying and training with several master bow makers. He is now a master bow rehairer and artisan in the Dallas-Fort Worth area. Mr. Rupert provides a high-level specialty service that has been needed in the Dallas-Fort Worth area for a long time. As a performer, Mr. Rupert knows what is important in having a rehair done properly and is unequaled in quality and dedication to his craft. Nearly a decade ago, Mr. Rupert made a friend that opened a Dunn Bros. coffee shop in Addison, Texas. Together, they learned how to roast beans. It was absolutely fascinating; he loved this activity and really grew to appreciate coffee and all of its intricacies. Thanks for the Press! And, the opportunity! Advice: What should I order at a third-wave coffee shop?